"Mohican's Landing" is stunning mountain home that offers the splendor reserved for magazine pictorials. The 5,300-square-foot home has 5 bedrooms, 4 full baths, 1 half bath, and can sleep up to 10 comfortably is awaiting the arrival of you and your family (sorry, no four-legged family members). The garage along with the paved drive and roads in the area make it a perfect destination for those riding motorcycles. With its open floor plan and 3 levels of living space, it is convenient for large groups. The dining table seats 10 and there is additional seating at the kitchen counter. There are dining sets on the deck for 10 and a gas grill. Plus, there is a one-car garage and ample parking. Chimney Rock Location with Broad River Frontage Located in Chimney Rock, North Carolina, the home’s scenic views of the Blue Ridge Mountains and frontage on the Rocky Broad River can be seen from any room in the house. Ample Entertainment Options Or stay in for a night of fun. Get you family and friends all cooking in the gourmet kitchen or go out on the large patio and grill under the stars. Relax on the deck and enjoy the sounds of nature and take in the incredible views. There is a game table (with seating for 4) on the main level with games to enjoy and a flat-screen TV on the wall. The lower level entertainment room has a pool table, ping pong table, and comfortable seating just to kick back and relax. 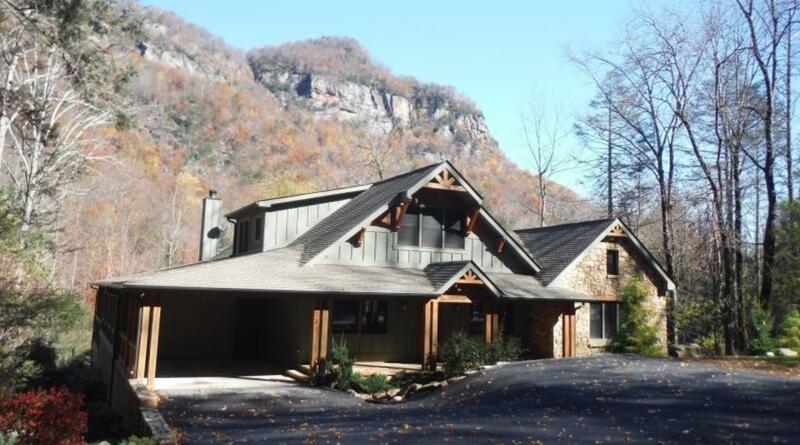 Perfect Getaway for Every Season This mountain home is perfect for every season! Enjoy the beautiful snowy weather in the winter where a cozy cabin feels just right. Stay warm by the fireplace or relax in the jetted tub in the master bath. Visit in the summer when the weather is perfect all the time and you can enjoy the soothing summer breezes and beautiful sunsets from the scenic porch overlook. No matter the season, this mountain home and the beautiful area will provide you the weekend getaway or vacation that you and your loved ones will never forget!